Ever wonder what types of papers are accepted for publication or want to know how to submit an article or paper to the HERD Journal? Come and meet editors, Kirk Hamilton and Jan Stichler at The Center's booth and get answers to all your HERD Journal questions. Kirk Hamilton, FAIA, FACHA, EDAC is co-editor of the Health Environments Research & Design (HERD) Journal, a Fellow and Interim Director of the Center for Health Systems & Design, as well as a Professor of Architecture at Texas A&M University in College Station, Texas, where his research area is the relationship between evidence-based design of health facilities and measurable organizational performance. He is also a Founding Principal Emeritus, WHR Architects, Houston and Dallas, Texas. Jaynelle F. Stichler, DNS, RN, EDAC, NEA-BC, FACHE, FAAN is co-editor of the Health Environments Research & Design (HERD) Journal and a Professor Emerita of Nursing at San Diego State University, and an Academic Partner with Sharp HealthCare where she serves as a research, professional development, and publishing consultant. Her research focuses on creating work environments that optimize organizational performance and the patient and provider experience. Take the EDAC exam at this year's Healthcare Design Expo & Conference in Washington D.C. and take advantage of a 10% discount plus our risk-free offer - you can re-take the exam once at no charge if you do not pass. A walk-in fee of $50 will apply. Here’s how: reserve your seat for the exam with your conference registration and then complete the exam application; use code HCD15 to receive the 10% discount (total charge for exam with discount is $319.50). 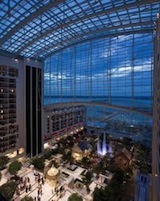 Once you receive the "Notice to Schedule" your exam, you will need to select the "Gaylord National Resort & Conference Center" location on November 16, 2015. And to prepare you for the exam, sign up for the EDAC Exam Prep Session on Saturday, November 14th (C03) and maximize your chance of passing the EDAC exam. The Center's EDAC experts will help you understand the five domains of the exam content outline and learn what types of questions to expect. A detailed review of the study guides and sample exam will be conducted along with time for questions.